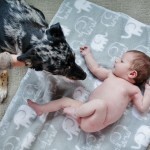 This month our Seattle veterinarians are talking about Valley Fever. Valley Fever is a fungal disease that has now been discovered in the soil of south-central Washington. Historically this disease has been common in the southwest United States and we think that is where Keta, our Hawthorne Hills Pet of the Month for August, was originally exposed. The ruler shows how much Keta’s toe was swollen. 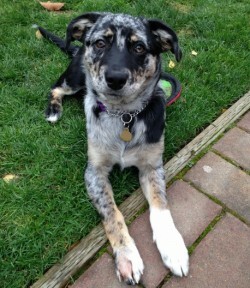 Keta was a young dog, barely 5 months old, last November when she was staying at a local boarding facility. 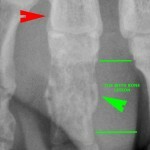 They noticed she was limping and initial radiographs by another veterinarian showed evidence of a bone infection. 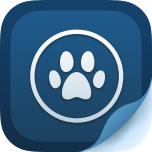 When the owners returned they brought Keta to the veterinarians at Hawthorne Hills Veterinary Hospital in Seattle for further diagnosis and treatment. 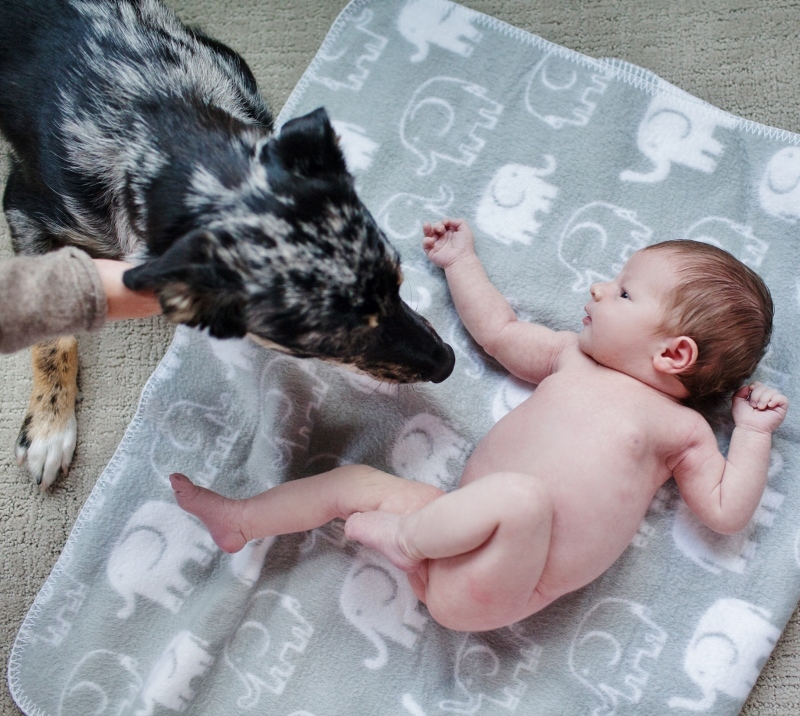 It is not uncommon for puppies to get bumps and bruises just like many young children, but this was different. Keta was rambunctious yet her owners had not observed any particular injury that would have caused the dramatic swelling of her toe. 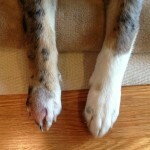 We admitted Keta to the hospital and sedated her to explore the wound on her right front paw. Dr. Robin Riedinger took samples for culture & sensitivity, a fine needle aspirate for cytology, and then cleaned the wound and applied a bandage for support and comfort. Medications for infection and pain control were started as well. Our local diagnostic lab called the next day to say they had isolated a fungal organism called Coccidioidomycosis. Because of the risk of zoonosis (spread to people), the reference lab took immediate precautions to avoid exposure at the lab and advised us about precautions for Keta and her owners. 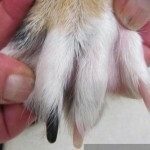 Dr. Riedinger also consulted with a veterinary specialist in Arizona who deals with this disease regularly. 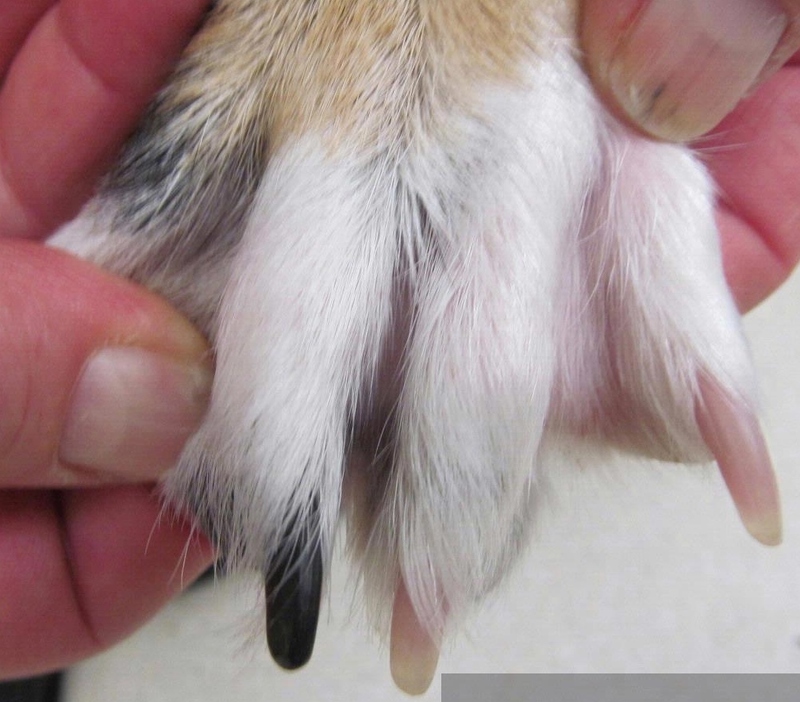 This fungal disease can be very challenging to treat, and it is important to reduce the likelihood for spread, so we readmitted Keta to the hospital for additional diagnostics and treatment. Keta’s bandage was removed and the wound left open to heal so that the organism could not grow in the wound. Full body radiographs were taken to see if there were lesions in the chest or any of the other bones. 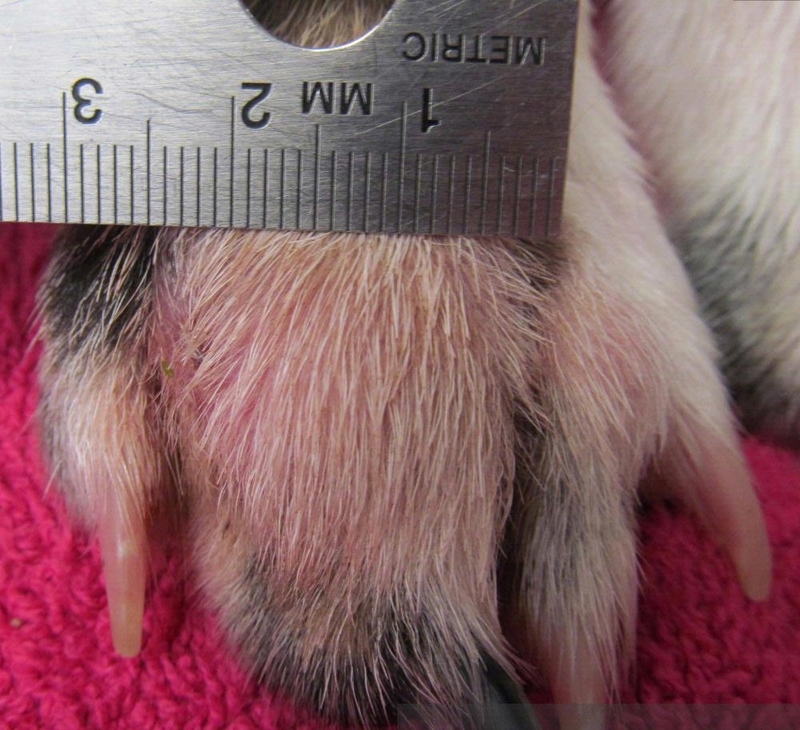 This helped us to know the extent of the fungal infection within Keta’s body. This organism is most often inhaled so the lungs are a common site of infection. Fortunately, Keta’s lungs looked normal. 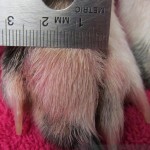 The toe was the only area of Keta’s body where we saw any lesions; for this reason we presume that she received a penetrating wound on the toe which led to the local infection, swelling and lameness. We submitted a blood sample for a confirmatory titer; it often takes several weeks for the titer testing so we started medications while we waited for the results. Keta came in for regular blood testing to evaluate for normal organ function as she was placed on long-term antifungal medication. We dispensed anti-inflammatory medication to reduce the swelling in the bone and soft tissues along with pain medication for Keta’s comfort. Treatment is often a year or more, and in some cases may be necessary for a lifetime. We are monitoring blood titers at regular intervals to see if Keta’s body is able to eliminate the infection. 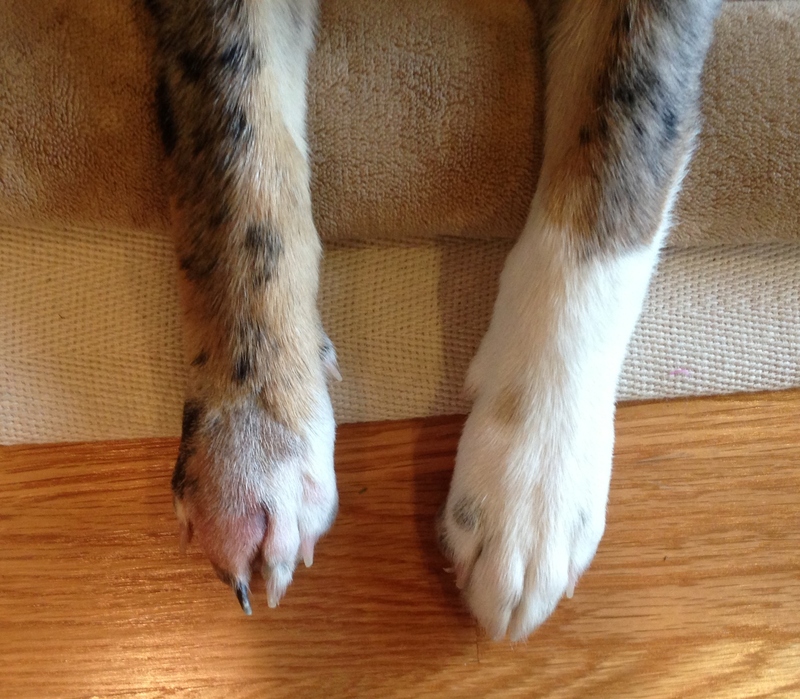 Over the last six months her blood titer has decreased and her toe has returned to almost normal. 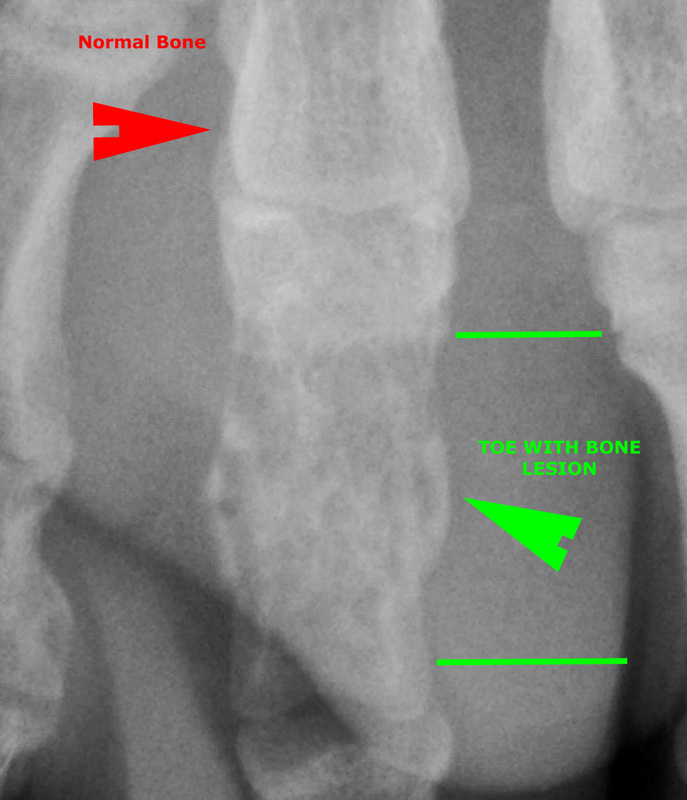 There is still some swelling but on radiographs the bone looks much healthier. While Keta’s owners will have to continue monitoring, Keta is comfortable and growing into a happy young adult dog. This disease is important for people to know about because the organism is present in soil, particularly in areas that are dry and hot. It is impossible to avoid exposure and there is no vaccine to prevent infection. People and animals are most commonly infected by breathing in the spores. It can take up to several weeks for symptoms to appear, and because they may appear flu-like, diagnosis and treatment is often delayed. The name “Valley Fever” comes from the location where it was first discovered, the San Joaquin Valley in California. However, the fungus is very common in the southwestern part of the United States especially Arizona. It is also present in parts of Mexico, as well as Central and South America.